Don’t miss- Best price, continental breakfast and summer walking tour included when you book on our website or call us directly. 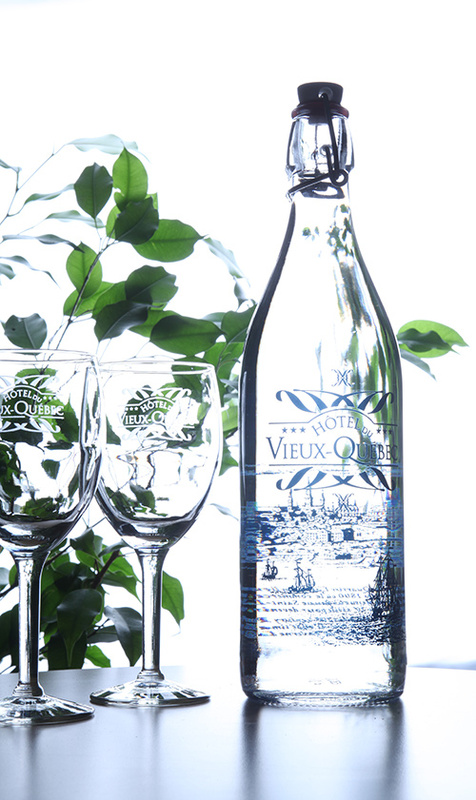 Hôtel du Vieux-Quebec is an officially recognized and award winning leader in the environmental movement. 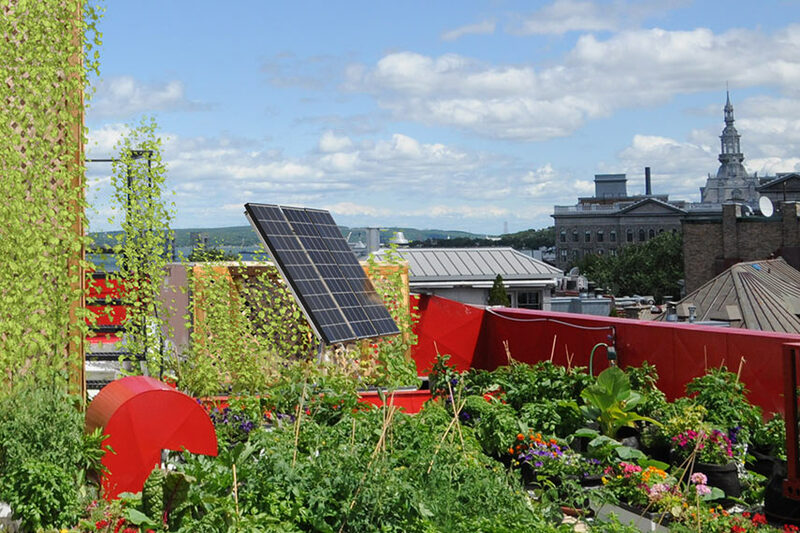 Committed to reducing its impact on our natural environment, this Quebec City hotel has launched a series of initiatives to lighten its ecological footprint. The hotel also has several larger-scale projects in the planning phase. Hôtel du Vieux-Québec is a carbon neutral operation. 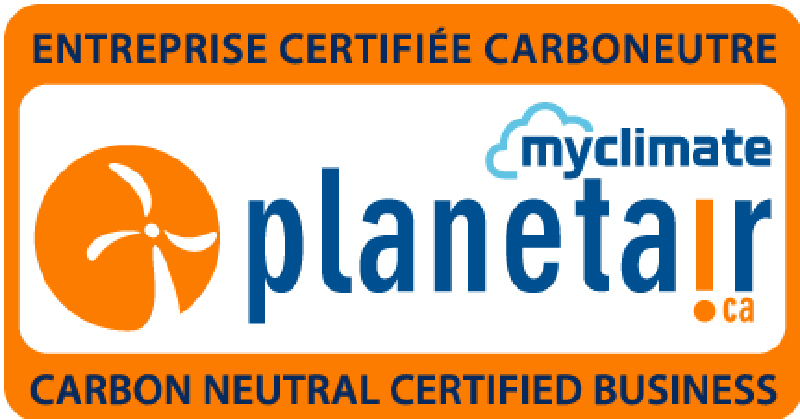 We purchase Gold Standard carbon offsets from ‘Planetair’ to compensate for all of our operations green house gas emissions. Gold Standard offsets adhere to the most widely accepted quality seal for voluntary offsets currently available. Through Planetair we only support renewable energy and energy efficiency projects. All projects must produce demonstrable contributions to the sustainable development of their host communities. The only hotel in Canada to use 100% 'green' natural biogas for the entire hotel. We say no fracking! HVQ proud to choose 100% biogas with Bullfrog Power. We are the first and only hotel in Canada to do this for the entire hotel. Biogas can be produced from raw materials such as agricultural waste, manure, municipal waste, plant material, sewage, green waste or food waste. Biogas is a climate-friendly alternative which is sourced from a methane-capture project situated on one of Canada’s landfill sites. Through innovative technology, biogas is captured, cleaned up, and injected onto the national natural gas pipeline, displacing fossil fuel-based gas and reducing CO2 emissions into the atmosphere. Bullfrog ensures the natural gas going into the pipeline on our behalf is from renewable sources instead of from natural gas sources that require fracking. During the fracking process, methane gas and toxic chemicals leach out from the well and contaminate nearby groundwater. The contaminated water is used for drinking water in local communities. A recent study by researchers at Johns Hopkins University found that homes located in suburban and rural areas near fracking sites have an overall radon concentration 39 percent higher than those located in non-fracking urban areas. Radon is the second leading cause of lung cancer worldwide. Natural gas is mostly methane, a highly potent greenhouse gas that traps 86 times as much heat as carbon dioxide. And because methane leaks during the fracking process, fracking may be worse than burning coal. 2018 - For nine years in a row, since 2009, Hôtel du Vieux-Québec has been awarded 5/5 Green Keys from the Hotel Association of Canada’s Green Leaf Eco-Rating Program. 2013 – Hôtel du Vieux-Québec was awarded the ‘Green Leadership Award’ by Hotelier Magazine. This annual award recognizes environmental excellence and innovative practices within Canada’s hospitality industry. 2010 – Hôtel du Vieux-Québec won the ‘Award of Excellence for Energy and Environment’ from the Hotel Association of Canada. This was the first time the award went to a Hotel in the province of Quebec. Travel can be environmentally taxing, ensure that your stay is the greenest it can be! -The production of local honey. The restaurant Tournebroche uses our honey in their desserts and drinks. 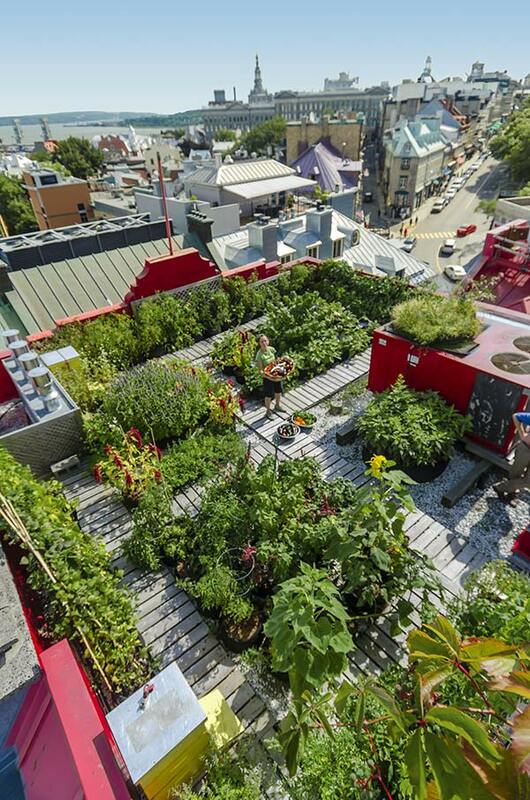 Hôtel du Vieux Québec has installed three green roofs. 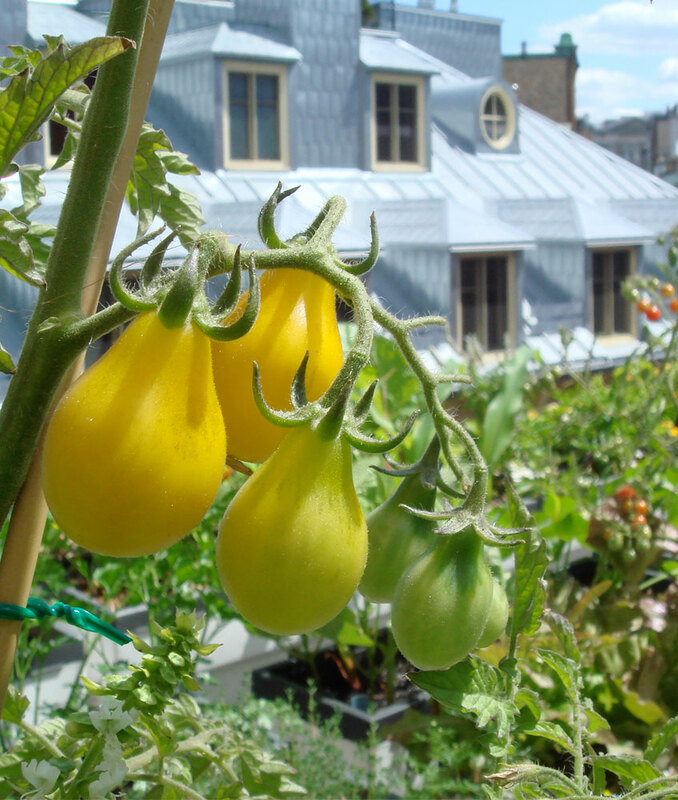 Our rooftop gardens grow an assortment of organic vegetables, flowers, herbs and other plants. This helps to keep part of the hotel cool in the summer thereby lowering our energy consumption, sequesters carbon and captures runoff rainwater. 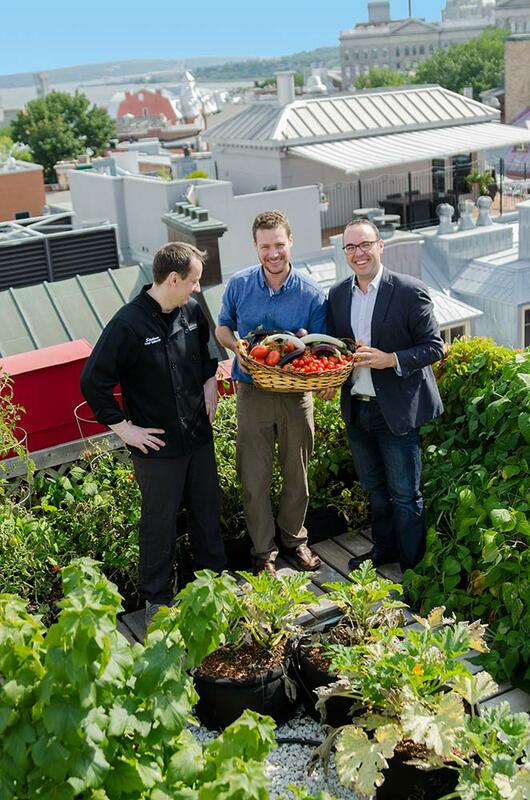 This also enables us to provide fresh organic produce for staff and clients. We also insure that our gardens have plants that help revive the health of bees, butterflies, birds, bats, and other pollinators in our area. Hôtel du Vieux Québec has been awarded 5 Green Keys from the Hotel Association of Canada’s Green Leaf Eco-Rating Program. This is the highest rating given. The rating description by the Hotel Association of Canada for 5 Green Keys is: A hotel that exemplifies the highest standards of environmental and social responsibility throughout all areas of operations. The hotel employs cutting edge technologies, policies, and programs that set the international standard for sustainable hotel operations. Water efficient toilets have been installed in all renovated guest rooms. All pre-renovation toilets have been installed with toilet tank fill diverters. All faucets in bathrooms are low flow or have had water saving 1.5 or 0.5 G.P.M. 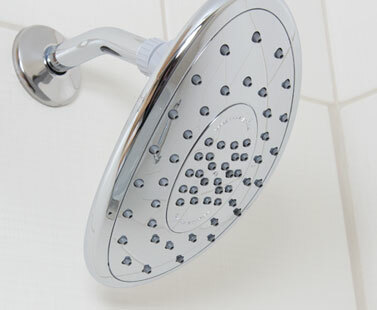 aerators installed and 75% of shower heads are high powered but low flow. Installation of a filtered water dispenser in the hotel lounge.Guests are encouraged to refill their portable water bottles at the water dispenser, to reduce guest bottled water consumption. 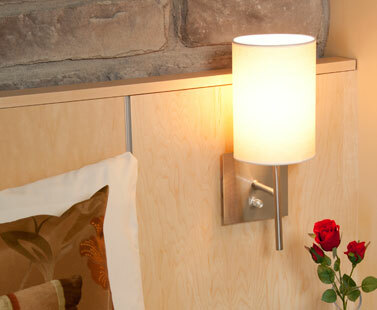 We have converted more than 95% of the hotel lighting to energy efficient lighting. Including: conversion to low mercury compact fluorescent light bulbs wherever possible and the installation of LED lighting systems in our guest rooms, meeting room, hallways and other facility rooms in the hotel. This saves us an average of 66,580 KWH yearly. We insure the conscientious disposal of used bulbs. Another project that has been generated from the research and observations of our hotel’s environmental team is our filtered water bottle project (inaugurated 2012). With increased public awareness of the unsustainability of bottled water consumption, and after observing the waste of large quantities of used water bottles left in the rooms from guests, HVQ decided to embark upon a re-usable filtered water bottle project that serves to reduce guests consumption of plastic bottled water. Each of our hotel’s guestrooms are supplied with two decorative glass-water bottles that have been sterilized, filled with filtered tap water and sealed, ready for consumption. The project is a great success; guests appreciate having quality filtered water available to them during their stay, and our environmental team is thrilled to note a marked depreciation by 70% of guest bottled-water consumption. H.V.Q. has installed photovoltaic panels that are converting sunlight into electricity. We use this solar energy to help power our top floor and exterior L.E.D. lights. 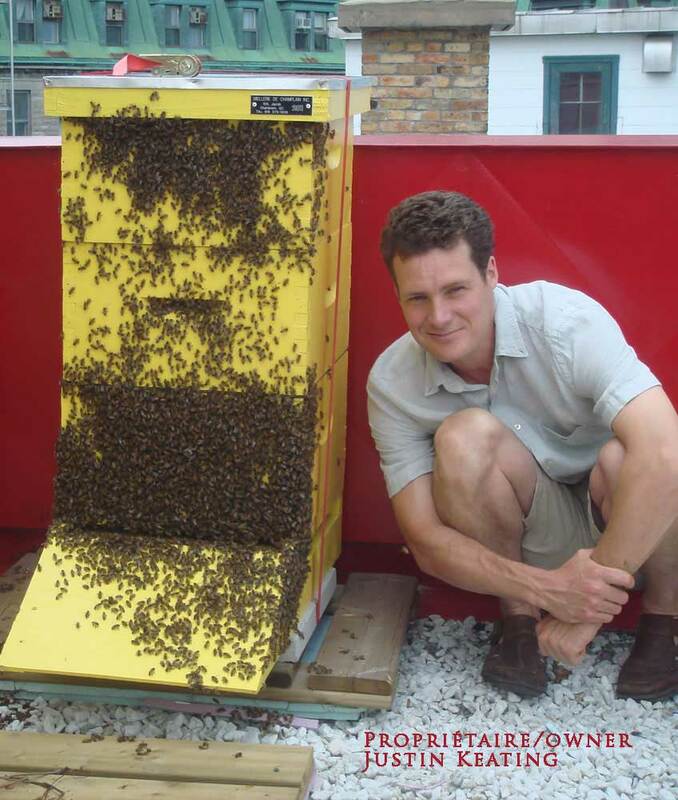 Placed beside our rooftop garden, the panels are also conveniently providing shelter for one of our beehives. All new furniture is custom made by local Quebecois craftsmen using materials that are consistent with the highest standards of LEED building. We also exclusively use Forest Stewardship Council (FSC) certified wood in all renovation and capital projects. The bistro restaurant - Le Tournebroche, which is attached to the hotel, follows our philosophy of being ecologically responsible. It features fresh locally grown organic food. The restaurant uses the vegetables, fruits and herbs grown in the summer on our rooftop gardens and uses the honey from our beehives in it's desserts, cocktails and gourmet specialties. We use a heat exchanger to capture and reuse heat from drain water to pre-heat incoming water. 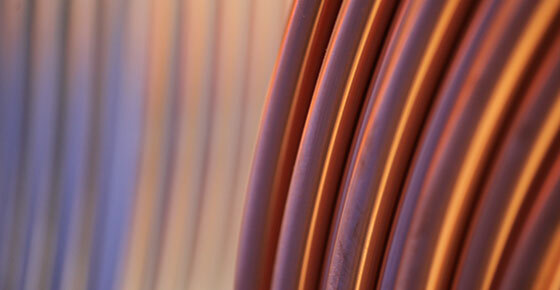 This technology reduces our primary energy consumption for water heating. Our environmental commitment also involves raising awareness and involving our employees. So we organized a friendly contest encouraging them to reduce their waste and to compost their organic waste. This contest has allowed them to realize that by introducing new habits in our daily lives, we can easily reduce our ecological impact and contribute to a better health of our planet. All the employees who participated were therefore winners because they learned to better manage their waste, but we highlight the exceptional efforts of Nathan, who has clearly distinguished himself in his involvement. Well done Nathan! - Exclusive use of certified environmentally friendly cleaning and laundry products. - Conversion to 100% recycled paper throughout the hotel. The hotel uses the back side of used paper for in house printing needs. - Conversion to 100 % recycled toilet paper and tissue in our guestrooms and public bathrooms (Cascades products). - We are an active supporter of local charities. - During regular working hours hotel employees volunteer their time and services towards various environmental projects. - Elimination of wasteful amenities bottles and individual soaps by converting to amenity dispensers, filled with high quality, organic, locally made natural beauty products that are not tested on animals. - Used furniture and electronics are donated to local charities. - Recycling receptacles in all rooms for mixed use recycling. - Garbage bags in rooms are biodegradable. - Elimination of disposable cups in guestrooms. - Glassware and ceramic mugs are provided for water and coffee. Ceramic plates, metal cutlery and cloth napkins are provided in the complimentary breakfast baskets. - Motion detectors in storage closets. - We include local organic products in the breakfast baskets when possible. - Coffee dispenser is equipped with organic fair trade coffee and sugar, biodegradable coffee cups, renewable bamboo stir sticks.